In 1992, President George H.W. Bush placed a moratorium on underground nuclear weapons testing. As a result, alternate experimental methods for certifying the Nation’s nuclear weapons stockpile were implemented. Among these experimental methods was the Joint Actinide Shock Physics Experimental Research (JASPER) Facility, located at the NNSS. JASPER plays an integral role in the certification of the Nation's nuclear weapons stockpile by providing a method to generate and measure data pertaining to the properties of materials (i.e., radioactive chemical elements) at high shock pressures, temperatures, and strain rates. These extreme laboratory conditions approximate those experienced in nuclear weapons. Data from the experiments is used to determine material equations-of-state and to validate computer models of material response for weapons applications. Experiment results are used for code refinement, permitting better predictive capability and ensuring confidence in the U.S. nuclear stockpile. The JASPER Facility is a multi-organizational research facility hosting Lawrence Livermore National Laboratory (LLNL), Los Alamos National Laboratory (LANL), the NNSA, and the NNSS. LLNL maintains the responsibility for Secondary Re-Op, physics requirements, and Program guidance while NSTec maintains the Primary Re-Op that covers general maintenance, diagnostic set-up and data capture, system engineering, health, and safety. JASPER experiments primarily support the Stockpile Stewardship Program in several ways complementing subcritical experiments conducted at the NNSS. 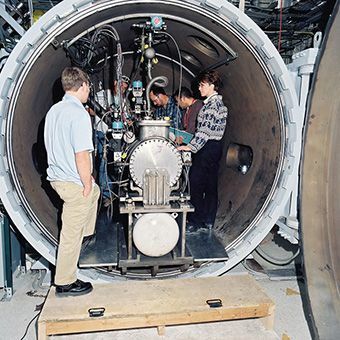 To achieve the high shock pressures, temperatures, and strain rates similar to that of a nuclear weapon, JASPER experiments utilize a two-stage gas gun. The basic concept of a gas gun is to propel a projectile into a target at high velocities - up to eight kilometers per second. 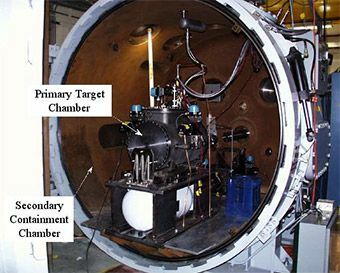 The JASPER gas gun has many capabilities but it is specifically designed to conduct research using plutonium and other actinide materials as targets. The two-stage gas gun consists of a first-stage breech containing gunpowder and a pump tube filled with a light gas such as hydrogen, helium, or nitrogen; and a second-stage evacuated barrel for guiding the high-velocity projectile to a target containing radioactive material. Hot gases from the burning propellant drive a heavy piston down the pump tube, compressing the gas. At sufficiently high pressures, the gas eventually breaks a rupture valve and enters the narrow barrel, propelling a projectile housed in the barrel, toward the target. When the projectile hits the target, it produces a high-pressure shock wave. In a fraction of a micro-second, the shock wave reverberates through the target. Diagnostic equipment, triggered by the initial wave, measures the properties of the shocked material inside the target during this extremely brief period. The target is disintegrated by the impact of the projectile and contained within the primary confinement chamber. A second confinement chamber protects workers as a safety precaution in the unlikely event the primary system fails. The data from these experiments is used by the national laboratories to further refine the computer codes used to certify the U.S. nuclear stockpile.